Examples of several eutriconodonts. 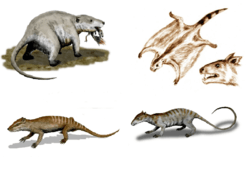 Clockwise: Repenomamus, Volaticotherium, Jeholodens and Yanoconodon. These occupy vastly different ecological niches: bulky semi-fossorial carnivore, glider, arboreal insectivore and aquatic piscivore, respectively. 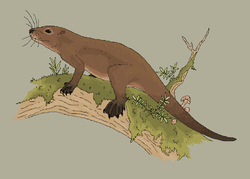 Eutriconodonta is an order of early mammals. Eutriconodonts existed in Asia, Europe, North and South America during the Jurassic and the Cretaceous periods. The order was named by Kermack et al. in 1973 as a replacement name for the paraphyletic Triconodonta. Traditionally seen as the classical Mesozoic small mammalian insectivores, discoveries over the years have ironically shown them to be among the best examples of the diversity of mammals in this time period, including a vast variety of bauplans, ecological niches and locomotion methods. "Triconodonta" had long been used as the name for an order of early mammals which were close relatives of the ancestors of all present-day mammals, characterized by molar teeth with three main cusps on a crown that were arranged in a row. The group originally included only the family Triconodontidae and taxa that were later assigned to the separate family Amphilestidae, but was later expanded to include other taxa such as Morganucodon or Sinoconodon. The phylogenetic analyses found that all these taxa did not form a natural group, and that some traditional "triconodonts" were more closely related to therian mammals than others. Some traditional "triconodonts" do seem to form a natural group (or "clade"), and this was given the name Eutriconodonta, or "true triconodonts). Most analyses use only dental and mandibular characters. Gao et al. (2010) conducted a second analysis as well, using a modified version of the matrix from the analysis of Luo et al. (2007); this analysis involved a broader range of Mesozoic mammaliaforms and more characters, including postcranial ones. Both Luo et al. (2007) and the second analysis of Gao et al. (2010) recovered a more inclusive monophyletic Eutriconodonta that also contained gobiconodontids and Amphilestes; in the second analysis of Gao et al. it also contained Juchilestes (recovered as amphidontid in their first analysis, the only amphidontid included in their second analysis). However, Gao et al. (2010) stressed that jeholodentids and gobiconodontids are the only eutriconodonts with known postcranial skeletons; according to the authors, it remains uncertain whether the results of their second analysis represent true phylogeny or are merely "a by-product of long branch attraction of jeholodentids and gobiconodontids". Phylogenetic studies conducted by Zheng et al. (2013), Zhou et al. (2013) and Yuan et al. (2013) recovered monophyletic Eutriconodonta containing triconodontids, gobiconodontids, Amphilestes, Jeholodens and Yanoconodon. The exact phylogenetic placement of eutriconodonts within Mammaliaformes is also uncertain. Zhe-Xi Luo, Zofia Kielan-Jaworowska and Richard Cifelli (2002) conducted an analysis that recovered eutriconodonts within the crown group of Mammalia, i.e. the least inclusive clade containing monotremes and therian mammals. The analysis found eutriconodonts to be more closely related to therian mammals than monotremes were, but more distantly than (paraphyletic) amphitheriids, dryolestids, spalacotheriid "symmetrodonts" and multituberculates were. This result was mostly confirmed by Luo et al. (2007), the second analysis of Gao et al. (2010), Zheng et al. (2013), Zhou et al. (2013) and Yuan et al. (2013), although in the phylogenies of Luo et al. (2007) and Yuan et al. (2013) eutriconodonts were in unresolved polytomy with multituberculates and trechnotherians. If confirmed this would make eutriconodonts one of the groups that can be classified as mammals by any definition. Several other extinct groups of Mesozoic animals that are traditionally considered to be mammals (such as Morganucodonta and Docodonta) are now placed just outside Mammalia by those who advocate a 'crown-group' definition of the word "mammal". However, Luo, Kielan-Jaworowska and Cifelli (2002) tested alternative possible phylogenies as well, and found that recovering eutriconodonts outside the crown group of Mammalia required only five additional steps compared to the most parsimonious solution. The authors stated that such placement of eutriconodonts is less likely than their placement within the mammalian crown group, but it cannot be rejected on a statistical basis. The most recent cladogram is by Thomas Martin et all 2015, in their description of Spinolestes. Eutriconodonts are recovered as a largely monophyletic group within Theriimorpha. When eutriconodonts first appeared is unclear. The earliest remains come from the late Early Jurassic (Toarcian), but they already represent a variety of groups: the volaticotherian Argentoconodon, the alticonodontine Victoriaconodon and the gobiconodontid Huasteconodon, as well as the putative eutriconodont "Dyskritodon" indicus. They achieve their peak diversity across the Early Cretaceous, before largely disappearing of the fossil record in the early Late Cretaceous outside of North America. The Campanian genus Alticonodon is the youngest representative of the group; the Campanian/Maastrichtian Austrotriconodon was originally referred to as a late surviving member of the clade, but has since been moved to Dryolestoidea. Most eutriconodont remains occur in laurasian landmasses. The exceptions are Argentoconodon and slightly younger Condorodon from the Early Jurassic of Argentina, the putative Dyskritodon indicus from the Early Jurassic of India (Kota Formation), the Late Jurassic Tendagurodon from Tanzania (Tendaguru Formation) and several Early Cretaceous north african taxa like Ichthyoconodon, Dyskritodon amazighi and Gobiconodon palaios. Due to the rarity of the Jurassic gondwanan fossil record the presence of eutriconodonts in southern landmasses may be of interest, due to their comparatively early age. Life restoration of Spinolestes xenarthrosus, one of the most complete eutriconodont fossils. Like many other non-therian mammals, eutriconodonts retained classical mammalian synapomorphies like epipubic bones (and likely the associated reproductive constrictions), venomous spurs and sprawling limbs. However, the forelimb and shoulder anatomy of at least some species like Jeholodens are similar to those of therian mammals, though the hindlimbs remain more conservative. Eutriconodonts had a modern ear anatomy, the main difference from therians being that the ear ossicles were still somewhat connected to the jaw via the Meckel's cartilage. Triconodon itself has been the subject to cranial endocast sudies, revealing an unique brain anatomy. Some eutriconodonts like Spinolestes and Volaticotherium were very well preserved, showing evidence of fur, internal organs and, in the latter, of patagia. Spinolestes shows hair similar to that of modern mammals, with compound hair follicles with primary and secondary hair, even preserving traces of a pore infection. It also possesses a clear thoracic diaphragm like modern mammals, as well as spines, dermal scutes and an ossified Meckel's cartilage. Furthermore, Spinolestes may also display signs of dermatophytosis, suggesting that gobiconodontids, like modern mammals, were vulnerable to this type of fungal infection. Some forms like Liaoconodon are thought to have been aquatic. Volaticotherins, such as Volaticotherium are particularly notable for their specializations towards gliding. The eutriconodont triconodont dentition has no analogue among living mammals, so comparisons are difficult. There are two main types of occlusion patterns: one present in triconodontids (as well as the unrelated morganucodontan mammals), in which lower cusp "a" occludes anterior to upper cusp "A", between "A" and "B", and one present in amphilestids and gobiconodontids, in which the molars basically alternate, with the lower cusp "a" occluding further forward, near the junction between two upper molars. However, its clear that most if not all eutriconodonts were primarily carnivorous, given the presence of long, sharp canines,[note 1] premolars with trenchant main cusps that were well suited to grasp and pierce prey, strong development of the madibular abductor musculature, bone crushing ability in at least some species and several other features. Triconodont teeth are known to have had a shearing function, allowing the animal to tear through flesh much like carnassial teeth of therian mammals. Jugulator amplissimus was a fairly large species, and possibly also a glider. Eutriconodonts are often among the largest mammals in Mesozoic faunal assemblages, displaying a broad size range from small shrew-like insectivores to large forms like Repenomamus, Gobiconodon, Triconodon and Jugulator. They were among the first mammals to be specialised for vertebrate prey, and likely occupied the highest trophic levels among mammals in their faunal communities. Several forms like Gobiconodon and Repenomamus show evidence of scavenging, being among the few Mesozoic mammals to have significantly exploited that. At least in carnivorous niches, eutriconodonts were probably replaced by deltatheroidean metatherians, which are the dominant carnivorous mammals in Late Cretaceous faunal assemblages. Some eutriconodonts were instead among the most specialised of Mesozoic mammals. Several taxa like Astroconodon, Dyskritodon and Ichthyoconodon may show adaptations for piscivory and occur in aquatic settings with their molars being compared to those of seals and cetaceans. Caution has been advised in these comparisons, however; as many researchers like Zofia Kielan-Jaworowska have noted, eutriconodont molars are more functionally similar to those of terrestrial carnivorans than pinnipeds and cetaceans, occluding in a shearing motion instead of not-occluding and providing a grasping function. However, Dyskritodon and Ichthyoconodon's teeth shows no erosion associated with aquatic transportation, meaning that the animals died in situ or close. Recently, studies on Yanoconodon and Liaoconodon show that they had adaptations for an aquatic lifestyle, possessing a barrel-like body and paddle-like limbs. Additionally, Volaticotherium and Argentoconodon show adaptations for aerial locomotion. 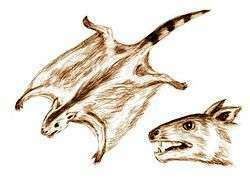 Both genera are closely related, implying a long lived lineage of gliding mammals. At least Spinolestes had xenarthrous vertebrae and osseous scutes, convergent to those of modern xenarthrans and to a lesser extent the hero shrew. This genus may have displayed an ecological role similar to that of modern anteaters, pangolins, echidnas, aardvark, aardwolf and numbat, being the second known Mesozoic mammal after Fruitafossor to have done so. ↑ In gobinocontids, though, the incisors are also long and fang-like; in Gobiconodon, the lower incisors outrightly replace the canines, which are vestigial. ↑ Kermack, K.A. ; Mussett, F.; Rigney, H.W. (1973). "The lower jaw of Morganucodon". Zoological Journal of the Linnean Society. 53 (2): 87–175. doi:10.1111/j.1096-3642.1973.tb00786.x. OCLC 4650939832. 1 2 A. O. Averianov; A. V. Lopatin (2011). "Phylogeny of Triconodonts and Symmetrodonts and the Origin of Extant Mammals". Doklady Biological Sciences. 436 (1): 32–35. doi:10.1134/s0012496611010042. ↑ George Gaylord Simpson (1929). "American Mesozoic Mammalia". Memoirs of the Peabody Museum of Yale University. 3: 1–235. 1 2 3 4 5 Chun-Ling Gao; Gregory P. Wilson; Zhe-Xi Luo; A. Murat Maga; Qingjin Meng; Xuri Wang (2010). "A new mammal skull from the Lower Cretaceous of China with implications for the evolution of obtuse-angled molars and 'amphilestid' eutriconodonts". Proceedings of the Royal Society B: Biological sciences. 277 (1679): 237–246. doi:10.1098/rspb.2009.1014. PMC 2842676 . PMID 19726475. ↑ Jin Meng; Yuanqing Wang; Chuankui Li (2011). "Transitional mammalian middle ear from a new Cretaceous Jehol eutriconodont". Nature. 472 (7342): 181–185. doi:10.1038/nature09921. PMID 21490668. 1 2 3 Luo, Z.-X. ; Chen, P.; Li, G.; Chen, M. (2007). 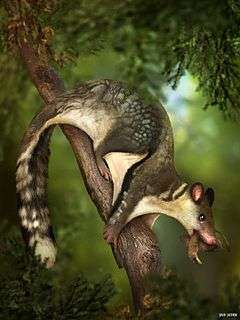 "A new eutriconodont mammal and evolutionary development in early mammals.". Nature. 446 (7133): 288–293. doi:10.1038/nature05627. PMID 17361176. 1 2 Xiaoting Zheng; Shundong Bi; Xiaoli Wang; Jin Meng (2013). 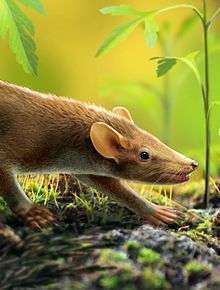 "A new arboreal haramiyid shows the diversity of crown mammals in the Jurassic period". Nature. 500 (7461): 199–202. doi:10.1038/nature12353. 1 2 Chang-Fu Zhou; Shaoyuan Wu; Thomas Martin; Zhe-Xi Luo (2013). "A Jurassic mammaliaform and the earliest mammalian evolutionary adaptations". Nature. 500 (7461): 163–167. doi:10.1038/nature12429. 1 2 Chong-Xi Yuan; Qiang Ji; Qing-Jin Meng; Alan R. Tabrum; Zhe-Xi Luo (2013). "Earliest Evolution of Multituberculate Mammals Revealed by a New Jurassic Fossil". Science. 341 (6147): 779–783. doi:10.1126/science.1237970. 1 2 Zhe-Xi Luo; Zofia Kielan-Jaworowska; Richard L. Cifelli (2002). "In quest for a phylogeny of Mesozoic mammals". Acta Palaeontologica Polonica. 47 (1): 1–78. ↑ Traditionally, membership in Mammalia is diagnosed by the presence of a single dominant jaw joint, in which the dentary contacts the squamosal. However, taxonomists debate whether established names, such as Mammalia, should correspond to the clade which is closest to the traditional definition or, alternatively, should be restricted to the 'crown-group' (which includes only descendants of the most recent common ancestor shared by all living member species and excludes any fossil forms which diverged at an earlier stage, even if they meet the traditional criteria). Supporters of the crown-group approach refer to the broader grouping as the Mammaliformes or Mammaliaformes, whereas traditionalists describe the entire assemblage as "mammals". For a summary of the argument and issues, see Benton 2005: 289. 1 2 3 4 Percy M. Butler; Denise Sigogneau-Russell (2016). "Diversity of triconodonts in the Middle Jurassic of Great Britain" (PDF). Palaeontologia Polonica 67: 35–65. doi:10.4202/pp.2016.67_035. ↑ Sigogneau-Russell, D. (1995) Two possibly aquatic triconodont mammals from the Early Cretaceous of Morocco. Acta Palaeontologica Polonica. 40(2), p.149-162.